I thought I could use yesterday’s Way to Use it Challenge to create a card for today’s sketch. Boy…that was a tough one! Julia challenged us to use purple on our card! Purple? Really? I don’t like purple…I wasn’t even sure I had any purple Designer paper. I checked my stash and found a few sheets with purple in my Basic Grey Euphoria pack. I recently received my first order of Bella stamps, but hadn’t played with them yet. I picked the darling butterfly to try out first. It’s just so adorable. I stamped it with Tuxedo Black Ink on Neenah cardstock, cut it out with Circle Nestabilities and colored it with Copic Markers (YG000, YGoo, YG21, YG23, YG25,RV02, RV04, Rv10, RV17, V15, V17). 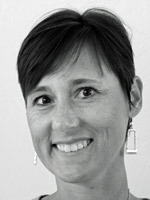 The image was then first layered on black cardstock, then on Purple Core’dinations cardstock. Stardust stickles was added to the pink dots and Tiny Twinkles on the bows on her antena. I really like how my butterfly looks, but I am not so sure about the rest of the card. Oh well….I can’t love all of my cards, right? The Core’dinations card base measures 4″ x 12″ and was folded it half. A 3 1/2″ x 5 1/2″ piece of Euphoria Paper was adhered to a 3 11/16″ x 5 11/16″ piece of Black cardstock and sewn together. The two wider strips measure 3/4″ x 4 3/4″, the smaller one 1/2″ x 4 3/4″. The thinner strip has a layer of punched black cardstock underneath (EK Success border punch). I had these layer originally like the sketch, but the black border looked better on the right, so I switched it around. To finish off the card I added three Kaiser Rhinestones on the top left and a bow out of May Arts Polka dotted organdy ribbon underneath the butterfly. 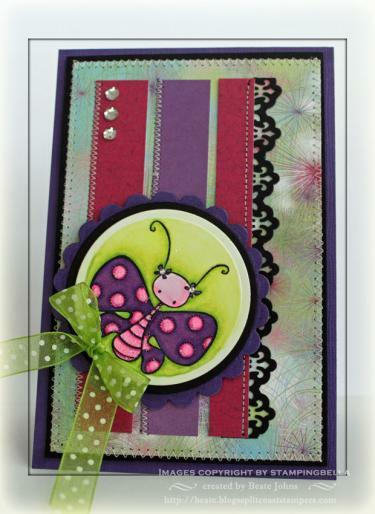 This card is very different from your usual style – different, but still absolutely gorgeous! I don’t like purple either. I love purple, it is my favorite color!! I love your coloring and shading on all your cards. Looks great! 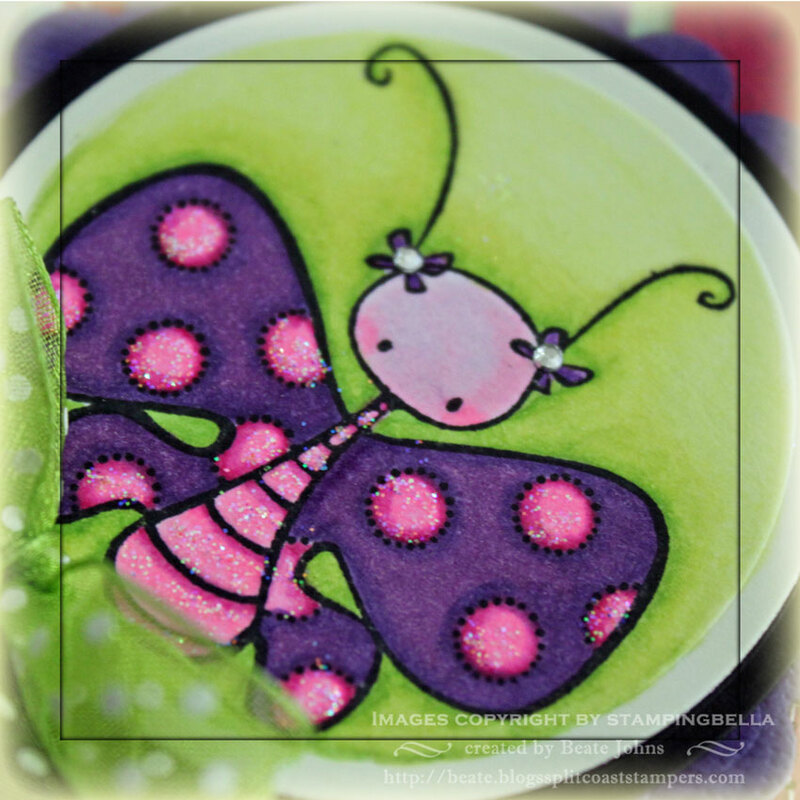 Very sweet little butterfly, Beate — love her in pink & purple! Love that punch, too (have it, need to use it!). Thanks for the inspiring sketch – hope you have a lovely Halloween! Oh, I love how you used the purple on your card Beate. I think that butterfly is super cute as well. Thanks for another wonderful sketch. Oh what a fun sketch, and such an adorable card, Beate!! Love your spooning around your image!! I love the card beate and my fav color is purple and red. I agree, purple is a difficult color. But you did a great job! I love the way you combined purple with apple green and a snif of pink. Infact purple and red can be an exciting combo as well. this is darling! off to give the sketch a go! I love your purple here, very nice! The butterfly is so cute!! LOL, you and your purple phobia 😉 You always make great cards with it though!! That butterfly is so stinkin’ cute!! So, so sweet! Love the bright, happy colors! Hugs, my friend!